We Mean Business > d i v e r s i t y w o m a n . c o m Fa l l 2 0 1 7 D I V E R S I T Y W O M A N 35 REASON #1: To gain clarity. Sometimes we know exactly what we want to do in life; other times, we have no clue. "is can be the toughest step of all," says California-based life coach Mary Allen, known as "America's Inner Peace Coach." She argues that if we don't choose, life will choose for us. A coach will help you explore options and discover what you really want in life, focusing on what's most important. To get there, Allen advises answering the following questions. • What's most important to you in life? • What's most important to you in your career? • What's most important to you in your relationships? • What are you tolerating in your life? • What do you want more of? • What do you want less of? Setting value-based goals will help you to get clear on what you really want. REASON #2: To assess any gaps. Jerilan Greene, a global chief communi- cations officer for Yum! Brands in Louis- ville, Kentucky, has always invested in a coaching relationship during transition periods. "As a midlevel manager for De- loitte years ago, I was learning a lot, but felt like there was something missing in terms of career development," says Greene. 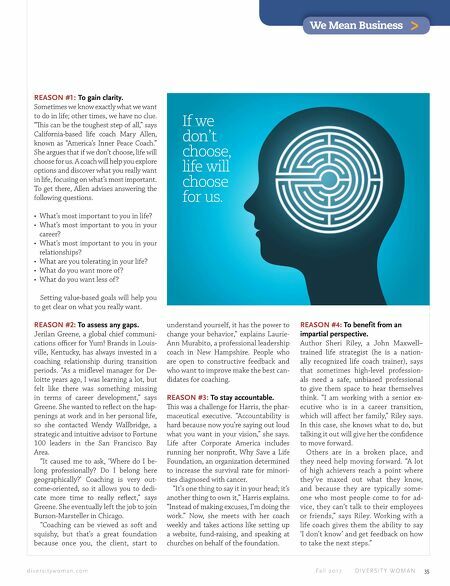 She wanted to reflect on the hap- penings at work and in her personal life, so she contacted Wendy Wallbridge, a strategic and intuitive advisor to Fortune 100 leaders in the San Francisco Bay Area. "It caused me to ask, 'Where do I be- long professionally? Do I belong here geographically?' Coaching is very out- come-oriented, so it allows you to dedi- cate more time to really reflect," says Greene. She eventually left the job to join Burson-Marsteller in Chicago. "Coaching can be viewed as soft and squishy, but that's a great foundation because once you, the client, start to understand yourself, it has the power to change your behavior," explains Laurie- Ann Murabito, a professional leadership coach in New Hampshire. People who are open to constructive feedback and who want to improve make the best can- didates for coaching. REASON #3: To stay accountable. is was a challenge for Harris, the phar- maceutical executive. "Accountability is hard because now you're saying out loud what you want in your vision," she says. Life after Corporate America includes running her nonprofit, Why Save a Life Foundation, an organization determined to increase the survival rate for minori- ties diagnosed with cancer. "It's one thing to say it in your head; it's another thing to own it," Harris explains. "Instead of making excuses, I'm doing the work." Now, she meets with her coach weekly and takes actions like setting up a website, fund-raising, and speaking at churches on behalf of the foundation. REASON #4: To benefit from an impartial perspective. Author Sheri Riley, a John Maxwell– trained life strategist (he is a nation- ally recognized life coach trainer), says that sometimes high-level profession- als need a safe, unbiased professional to give them space to hear themselves think. "I am working with a senior ex- ecutive who is in a career transition, which will affect her family," Riley says. In this case, she knows what to do, but talking it out will give her the confidence to move forward. Others are in a broken place, and they need help moving forward. "A lot of high achievers reach a point where they've maxed out what they know, and because they are typically some- one who most people come to for ad- vice, they can't talk to their employees or friends," says Riley. Working with a life coach gives them the ability to say 'I don't know' and get feedback on how to take the next steps." If we don't choose, life will choose for us.